Posted by Ali Zeeshan Be the first to comment! 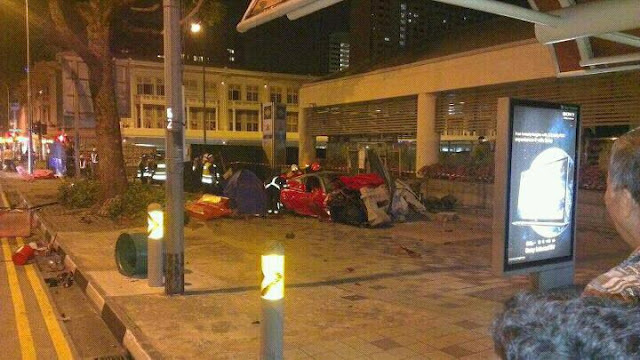 Fatal Accident this morning at Bugis involving Ferrari and Taxi: A netizen took a snapshot of a fatal accident this morning at Bugis involving a Ferrari, a Comfort taxi and a motorcycle. According to Channel News Asia, the accident occurred at the junction of Rochor Road and Victoria Street. An accident involving a Ferrari, a taxi and a motorcycle has left two dead and three others injured. The crash occurred in the wee hours of Saturday at the junction of Rochor Road and Victoria Street. The driver of the Ferrari, in his 30s, was pronounced dead at the scene by paramedics. Four others sustained injuries and were sent to various hospitals. Jay Chou Plans Engagement Party with Hannah Quinlivan : Jay Chou (周杰倫) will hold a romantic engagement party with teen model Hannah Quinlivan (昆凌) in Guam next month.They will fly close friends and relatives on a chartered flight there in June and will take care of all their accommodation and F&B bills, according to sources close to the couple. Industry insiders estimate the total cost will surpass NT$10 million ($340,000). But their respective managers denied the rumors, saying Jay and Hannah have super busy work schedules in June and therefore couldn’t possibly have the time to get engaged. Jay Chou and Hannah Quinlivan Getting Married Soon? Jay Chou and Hannah Quinlivan Getting Married: Rumour has it that multi-hyphenate Jay Chou and Hannah Quinlivan, his rumoured girlfriend who is 15 years his junior, will be getting hitched in Guam next month. The limelight has been on the couple since rumours of the pair dating each other surfaced last year, although they had denied the speculations. Recently, someone, who claimed to be a friend of Jay's mother, shared that the duo are going to tie the knot in Guam. However, another tip claimed that Jay and Hannah will get engaged in Guam instead, and relatives had already received invitations to the event. The speculations tied in with the 33-year-old's confession in an earlier interview that he wished to get married before he turns 35. The friend of Jay's mother also let on that the soft-spoken Hannah listens to Jay's mother, who shares interesting snippets of her life and good food with the 19-year-old. Hannah's affinity with Jay's mother is said to be a plus point for Jay, who is known to be a filial son. Responding to the absurd rumour, Jay denied, saying that "there's no such thing", while Hannah claimed that it is a groundless rumour. Jay's management had also shared that the singer's schedule for the next month is too packed for anything else, revealing that the 33-year-old will be filming the sequel to movie Secret in June. Now, how to add the Tweet Button to your blog? Go to Twitter’s Tweet button setup page, set your preferences button. Now, how to add Tweet Button to WordPress blog? Copy the following code and paste into your single or index page. If you’re using WordPress.com, just enable the tweet button from your admin page. Add Tweet Button to the Blogger template. Add Tweet Button to Tumblr blog. NOTE : Change the Twitter username (red-printed) with yours. Love triangle of Cyndi Wang, Sui and long-legged actor Yao Yuan Hao is the focus of media originating station the past few days. Many people sympathize with the two women and indignant silence of the male protagonist. A few days ago, supermodel Taiwan Sui and Yao Yuan Hao actor suddenly announced split after 8 years of relationship. It is believed that Yao Yuan Hao as broken with Sui is dating singer Cyndi Wang. On 8/5 and then, Cyndi Wang held a press conference to vindicate himself and said she and actor Hao Yuan merely just friends. Two days after the shock, long-legged Sui also brave to face the media. She said: "My heart as though it were cut into each knife" but she always hoped her ex-boyfriend has a happy life. During in the most painful period, Sui did not forget to thank her ex-boyfriend because of the grace love, attention and happy moments he has given the past 8 years with her. When you say these words, Sui does not stop crying. 31-year-old beauty also hope that, after this talk, the media will not exploit more about the relationship between her former lover and singer Cyndi Wang. She said: "I only wish good things for the best I've ever loved." After this brief interview, the famous long legs and wealth of Taiwan was moved to tears backstage fresh news almost an hour. The media were trying to contact Yao Yuan Hao actor with a desire to get the correct answer from him. After several days of silence, Yao Yuan Hao has also decided to speak out in a long letter nearly 300 letters sent to the media yesterday, 9/5. In particular, country radio actor apologized to both women are pulled into this relationship triangle is the Sui and Cyndi Wang. 30-year-old actor to thank former lover because "she saw that I was the man she loved most." He also stressed that Sui is the most important person in his life. He stressed: "I just like all other men but never want to hurt anyone." Previous rumors he betrayed Sui to sneak away with singer Cyndi Wang, Yuan Hao said, he is single people start to canTam Mausoleum. "I get people hurt by the lack of maturity in handling all his work," Yuan Hao admitted sadly. End, Yuan Hao draw that: "With a man, the sincerity is the most important thing in a relationship." Previous statements of Yuan Hao, many netizens have voiced his conviction that man sides, and lack of fidelity. In particular, female fans very disgruntled when Yuan Hao is the last of three people to speak about the incident after two women to face the pressure of the media for several days. After this, Yuan Hao has lost a significant number of fans. Read File in ext4 File System from Windows 7: Many people are using dual boot of Windows 7 and Linux on one PC or laptop. Linux operating system uses file system ext2, ext3, and ext4. Windows 7 does not support the file system. In contrast, most existing linux distro is able to read the NTFS file system. So, we need to do something to make Windows 7 can read or access ext2, ext3, or ext4. We could install Ext2fsd. Ext2Fsd is an ext2 file system driver for Windows 2000, XP, Vista. It’s a free software and everyone can distribute and modify it under GPL2. Here are the steps to install Ext2Fsd on Windows 7. 2. Before you install the file you’ve downloaded, you need to change compatibility. Right click and choose “Properties“. Set ‘compatibility mode’ to ‘Windows Vista Service Pack 2‘ and ‘Run as administrator’. 4. Extract patch file ext2fsd.sys to Windowssystem32drivers. 6. Stat Ext2 Volume Manager from Start Menu. 18 year old recruit attempted to swim out of tekong: An 18-year-old recruit from the Basic Military Training Centre (BMTC) on Pulau Tekong attempted to swim out of the island towards mainland Singapore, in what is believed to be the first such case to have happened. It is understood that the incident took place last December and he had made the swim attempt at night. However, he was spotted and picked up by the Police Coast Guard and handed back to the authorities at the training centre. The Ministry of Defence confirmed that the recruit "attempted to swim out of Pulau Tekong towards the main island of Singapore", The Straits Times reported on Wednesday. He was found on the Kechil Land Link, a strip of land linking pulau Tekong and Pulau Tekong Kechil, said Mindef spokesman Colonel Desmond Tan. But it is unclear how far he had swim when he was first spotted. Tan also did not give any specifics of the date and time in which the incident took place. When, queried, Tan declined to comment on what additional measures have been put in place or whether the recruit is still in active service. He would only say that the recruit — believed to be a science student from Raffles Institution — has been "disciplinary dealt with". For leaving the camp without permission, he could have been declared as having gone absent without official leave, an offence under military law punishable with a jail term in the detention barracks of up to two years. Those who knew him said the recruit kept a low profile, was soft-spoken but eloquent. He had enlisted in early December, and was then undergoing an eight-week-long programme called the Physical Training Preparatory (PTP) phase. Recruits placed under the programme are meant to raise their physical fitness ahead of the nine-week Basic Military training programme. Workers' Party Will Defend Hougang by Election In SMC: The Workers' Party says it will work as hard as it can to defend the Hougang Single Member Constituency (SMC). The Workers Party has called on the Government to abandon the EU Fiscal Treaty referendum on May 31 at its campaign launch calling for the treaty to be rejected. In its first posting on the party's website, after the Writ of Election was issued for the Hougang by-election, the Workers' Party also called on supporters to come forward to help in many ways possible. It says it will need supporters to be at the Nomination Centre at Serangoon Junior College on May 16, and also to help in many ways during the campaign. The Workers' Party did not name its candidate for the by-election on its website. Meanwhile, three other opposition parties have declared their stand not to contest the Hougang by-election. In a statement, the Secretary-General of the National Solidarity Party (NSP) Hazel Poa says after careful deliberation, the party has decided that it will not be fielding a candidate in the upcoming Hougang by-election. The Singapore Democratic Party (SDP), in a Facebook posting, reiterated that it will not be fielding a candidate for the Hougang by-election. The party had stated previously that it would not contest the by-election. The Singapore People's Party (SPP) has also confirmed that it will not be contesting the Hougang by-election. Its Secretary-General Chiam See Tong told Channel NewsAsia that it is best to avoid a three-cornered fight in Hougang. Joined Facebook · Lolliepopbestie is on Facebook. To connect with Lolliepopbestie, sign up for Facebook today. Sign up for Twitter to follow Lolliepop Bestie (@lolliepopbestie). As many as 90 tens of thousands of fans of Sonia in the face book group "Sonia Sonia Sui official fan group" last night WEBMASTER said: "Mission sigh: Tangtang (Sonia) has always been photo on her own this woman ... "and quoted Sonia would like to say to the fans, and hope the fans give her a little time to refuel and warm to her, and soon she will bring a smile back. The message mentioned: Tangtang want Let me tell you: She is just a man, and she is just falling out of love, she temporarily lost her smile, and a little courage, but give her some time, the heart shake out in the sun drying in the sun like; ask you to her, give her a little oil, a little warmth to her, and soon your eyes wild girl favorite laughing sun, they would take a new and better to come back. " Message along with a picture, Sonia described like the text in the photo: "very strange? I never look forward to a vacation in a romantic encounter, but also from Aventure, it should be said that I would not go to a short-term romance and talk, I can not say good forever, but at least I aspire to a long long time. " Sonia Sui Admitted Break up With Yao Yuan Hao: Sonia Sui Yao Yuan Hao The actress confessed that she has broken up with her boyfriend, hinting at a third party behind the breakup. Sonia Sui admitted to breaking up with her boyfriend before press conference and her eyes were full of tears, Yao Yuan Hao, at an event yesterday, just two days after defending the actor who was accused of having an affair with Cyndi Wang. On Wednesday night, Yuan Hao made a statement on his Facebook where he wrote, "After reading the news recently, I want to apologize to my friend who was dragged into the matter and I hope everyone will stop harassing the innocent friend." It was clear that the friend that the actor mentioned was Cyndi, who was speculated to be the third party in the couple's relationship. Meanwhile, during a Louis Vuitton event yesterday, Sonia let slip the couple's breakup under the barrage of questions from the media. "I hope that someone better will take care of him [for me]," she said, hinting at the presence of a third party. The actress shed tears, expressing, "Maybe I did not do well for the past eight years [that we were together]. I never thought that we will break up, and I can't explain the situation to you [the media] fully." Following the actress's confession, Yuan Hao's manager expressed that the couple had indeed parted ways and had not met for the past month. He emphasized that there is no third party behind the separation and it has nothing to do with Cyndi. Posted by Ali Zeeshan 3 Comments so far. What's your opinion? Sonia Sui: Although Sonia Sui and Yao Yuan-Hao have been on and off for 8 years, they reportedly got back together again in the latter half of last year, but Cyndi is suspected of being the third person. Recently, Cyndi Wang and Yao Yuan-Hao’s rumored relationship has been making news headlines in the entertainment section. Cyndi was spotted visiting Yao Yuan-Hao’s home several times, driving a white Mercedes-Benz of the model E250. They were seen intimately holding hands and hugging in the underground parking of Yao Yuan-Hao’s home late last year. Cyndi’s manager quickly refuted the claims saying that she drives a black Mercedes-Benz and not a white one. However, Appledaily visited Cyndi’s place two days ago and found the white Mercedes-Benz parked in her parking spot with the same license plate as the one seen at Yao Yuan-Hao’s garage. "I am not the third party! I have never come between them," said Taiwan singer-actress Cyndi Wang tearfully, during a press conference in Taiwan on Monday. Wang went on to refute rumours that she had caused Taiwan model-actress Sonia Sui and her boyfriend Taiwan actor Yao Yuan Hao to break up, reported Taiwan media. Sui, who had been dating Yao on and off for the past eight years, had earlier told the media that she hoped "someone else can take better care of him" when she recently confirmed that she had broken up with Yao in February, sparking rumours that Yao was seeing another woman. Alex Tan Zhixiang Decided to Quit Singapore for Good: Former Reform Party candidate Alex Tan Zhixiang has decided to quit Singapore for good I am one of those many young people out there like the commentator on Temasek Times above who have grown disillusioned of Singapore and wanting to emigrate out of here. Like him, I always go to explain at great lengths of how Singapore is really like to curious foreigners over a chat. My girlfriend is a S-pass holder and she totally agrees with what I’ve said about Singapore’s system and the sorry state of affairs here and how we will suffer like the rest with a government who takes their citizens for granted. We intend to get married this year but family planning or baby making is a no-no until we settled down in either Sans Franscisco(her cousin’s family is there already) or Auckland(my preference). I am currently getting my engineering degree and working full time to save up a modest fund by 2014 when I graduated. My current job as an engineer in a specialized trade is in the long term skill shortage list for immigration, and what attracted me is they are paying 2 to 3 times higher than what I’m getting here in Singapore. In Singapore, my trade is in high demand, but apparently the Singapore employers wants to have their cake and eat it too. They resorted to hiring cheap foreign engineers and expected the existing engineers to train them, which is impossible without the necessary qualifications in knowledge. These foreign engineers have a engineering degree but they are at best technician-quality and not engineers who innovate solutions and manage a team. The main reason why productivity is falling especially in my trade is because they hardly think about plausible solutions or simply just talk…perhaps talking is strenuous as their communication skills are poor, probably thinking too as their mindset are unfortunately very much framed up. There are enough frustrations working with low quality foreigners in our midst and I don’t see why I should put up working with them learning nothing new and always teaching, and if I want to teach, I might as well go back to be a A-Maths tutor like during my National Slavery days where I could easily earn more doing it full time today than what I could get now. In countries like New Zealand, they have a sound social safety net and their society’s order and economic indicators would never become as polarized and extreme like Singapore’s. Why? Simply because their governance is built on the choice of the people, and this is democracy I’m talking about. The citizens will moderate the country’s system with opposing forces always resonating among themselves to attract the majority’s support. But in Singapore, all of us have to listen to the PAP because the Opposition is kept very weak. There are no adaptations of any logical proposals that doesn’t run align with PAP’s political inclinations and the PAP will simply dismiss them as populist or radical(this choice of word by the PAP is a scare tactic…radical…oh my…could be a terrorist’s idea…like the wage shock therapy from Dr Lim Chong Yah). With PAP grassroot leaders and the mainstream media always currying favors by presenting skewed ground sentiments to their MPs and Ministers, Singaporeans ended up voiceless and policies become disconnected with reality. Look no further than at Lee Hsien Loong’s facebook. That is the breeding ground of radical PAP extremists. There are thousands of cult-like responses supporting the PAP and they would attack any anti-PAP sentiments or have the moderator deleting them like this[Link]. I sometimes wonder if I served National Slavery to protect these disgusting people, and there is 60% like them in Singapore. My decision to leave Singapore is more motivated by the push factors that are largely disappointments of Singapore’s system than the pull factors of retirement and family-friendly environments in New Zealand and US. Singapore is my home, I love Singapore especially when I grew up during the golden years that is the 1990s. I would like my children to grow up in the 1990s Singapore the way I did but that is no longer possible here. On my conscience level, at least I have decided to leave Singapore with a fight(that is to partake in the Opposition). I fought, I lost and now I’m gone because my family come first. People around me are telling me to stick for 2016 Elections and I told them I am not going to waste my youth here and I am telling my friends to leave as well, for my very last struggle with the PAP is to deny them the very young people they need to sustain their political dominance. Stefanie Sun is Pregnant: Is Stefanie Sun Yan Zi pregnant? The singer Stefanie is rumoured to be keeping her pregnancy But Yes! Singapore Stefanie Sun is pregnant and her first baby will roar into existence as a dragon baby. According to the press statement form her record label, the pregnancy was 'the best present the couple could receive'. The singer had also declined to perform in China, sparking news that she was pregnant. The singer expressed that she is happy that she can spend the upcoming Mothers' Day with her family and her unborn baby, adding that the pregnancy is still something new to her. Tags: stephanie sun pregnant,stephanie sun, 孙燕姿, sun yan zi, nadim van der ros, stefanie sun, Is Stefanie Sun Yan Zi pregnant? Gao Yuan Yuan: Mark Chao "happy" dating Gao Yuan Yuan: Taiwan actor Mark Chao (赵又廷) and China actress Gao Yuanyuan (高园园) were caught on camera holding hands while taking a walk the other night. The couple has not made public their relationship yet. Mark, 27, and Yuanyuan, 32, got along well while shooting director Chen Kaige’s (陈凯歌) Searching (搜索) late last year. The chemistry clicked into place after filming finished. In late March, a netizen claimed the two spent five romantic nights at a hotel in Nanjing, where Mark is shooting his new film. Mark, who shot to fame for his heroic role in Taiwan’s popular TV series Black & White (痞子英雄), previously dated actress Janine Chang. Lionel Yeo New CEO of Singapore Tourism Board STB: The Singapore Tourism Board (STB) will have a new chief executive, Mr Lionel Yeo, from June 1. Lionel Yeo, NMP Janet Koh's husband has been appointed CEO of Singapore Tourism Board. Mr Yeo will take over from Ms Aw Kah Peng, said the Ministry of Trade and Industry (MTI) today. Mr Yeo is currently deputy secretary (Development) in the Public Service Division (PSD) of the Prime Minister's Office and CEO and dean of the Civil Service College (CSC). MTI said Mr Yeo played a key role in building whole-of-government capacity for innovation, service delivery and strategic planning at PSD. He also positioned CSC as a learning partner to public sector organisations. Mr Kwek Mean Luck, formerly deputy secretary (Industry) in MTI, will take over Mr Yeo's current portfolio at PSD and CSC. Tin Pei Ling's husband is Ng How Yue, a Permanent Secretary in Ministry of Trade and Industry. Jospehine Teo's husband is Teo Eng Cheong, CEO of International Enterprise Singapore. Jessica Tan's husband is Alphonsus Pang, Director of MINDEF Corporate Development & Services Division. Strong Heart (Hangul: 강심장; Hanja: 强心臟) is a Korean talk show or talk battle broadcasted by SBS. Strong Heart airs from Tuesday, 11:50 pm to Wednesday, 12:30 am. About twenty star guests from Korea tell strong stories that make people cry or laugh. The best storyteller wins the show. Lee Seung Gi hosts the show. Running Man (Korean: 런닝맨) is a South Korean variety show; a part of SBS's Good Sunday lineup, along with K-pop Star. This show is classified as an "urban action variety"; a never-before-seen new genre of variety shows. The MCs and guests complete missions in a landmark to win the race. It first aired on July 11, 2010 with 92 episodes aired. LiveSoccerFree.blogspot.com | Live Streaming video football World Cup 2014 Qualifying , Premier league, UEFA Champions league, UEFA Europa cup, Serie A, La Liga BBVA, Bundes Liga and watch highlight video football for free ! Miss Singapore World 2012 Finalists: Miss Singapore World unveiled their 13 gorgeous finalists for this year's pageant at the Marina Boulevard. The singer entertains the guests before the girls are presented. The girls sit prettily backstage on a plushy sofa before they are presented officially to the guests. Reigning beauty queen, Miss May Hsu, joins the 2012 finalists in a group photo backstage. Winner of Miss Singapore World 2011, Miss May Hsu, addresses the crowd. Miss Singapore World 2012 Finalists Names: Wong Shu Yu, Tika Shera, Ng Shi Wah, Farah Atika, Sarah Noble, Jaime Lim, Bridgete Campbell, Nicole Olsen, Eileen Yap, Michelle Koh, Anisah, Farah Afiqah. Missing in photo: Nur Fareena, Jaime Lim, Nicole Olsen, Michelle Koh, Farah Atika, Sarah Noble. Singapore Armed Forces (SAF) regular serviceman was found dead at Changi Airbase earlier today. An SAF medic attended to him immediately at 9.35am and he was sent via ambulance to Changi General Hospital (CGH) at 10.25 am. The ambulance arrived at CGH at 10.40am and 2SG Suresh was pronounced dead at 10.30am. A MINDEF statement said SAF will be investigating his death and will extend its assistance to the family. 2nd Sergeant (2SG) Suresh S/O Seluras, aged 24, was found hanging from a rope in Changi Airbase this morning. An SAF ambulance with a medic were immediately dispatched to the scene at 9.35 am. They found 2SG Suresh unresponsive with no pulse, and attempted to resuscitate him. The serviceman was then sent by SAF ambulance to Changi General Hospital as resuscitation efforts continued. He was pronounced dead at 10.53 am at CGH. 2SG Suresh was a military policeman from the 608th Squadron. The Ministry of Defence and the SAF extend their deepest condolences to the family of the late 2SG Suresh. The SAF is assisting the family in their time of grief and is investigating the incident. A police investigation will also be conducted.